The day may come when all efforts to safeguard data at the production site has failed. Every minute of downtime could mean 10’s or 100’s thousands of dollars of lost revenue, and even worse, a damaged industry reputation. With asynchronous remote replication, the data is duplicated and becomes quickly accessible in the event that the production site becomes unavailable. Asynchronous mirroring provides the highest integrity and the most flexible disaster recovery service for all applications and business critical data. One of the first issues to resolve is the location of your remote site. This can be either one of your facilities far from your primary data center, a distant co-location facility shared with others, or a public cloud service. DataCore offers remote replication solutions to satisfy any of these choices. 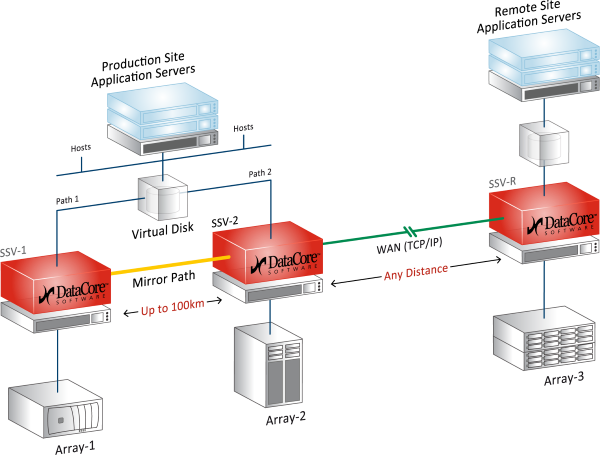 The graphic below illustrates a common configuration where the production site operates on a fully-redundant synchronously mirrored pair of DataCore nodes replicating asynchronously to a remote DataCore node over a WAN. Asynchronous remote replication copies all protected production volumes to the remote site where it can be used for disaster recovery. If you would like to take advantage of the scalability, flexibility and cost-efficiencies of cloud services and/or if you do not have an appropriate physical location available, DataCore™ Cloud Replication on the Azure Marketplace offers a convenient alternative. DataCore-authorized partners can help you remotely replicate to Azure while being able to recover from anywhere in the world and scale your offsite infrastructure as needed. Other options include replicating to Amazon Web Services. Allows the expansion and the ability to maximize the utilization of interconnections between nodes by increasing the functionality of the mirroring by utilizing dynamic active pathing to improve the throughput and resiliency. The data is safe at the remote site, now what? Many companies go this far, but fail to take the next critical step in their DR plan: Testing. With Asynchronous Remote Replication, non-disruptive tests can be conducted against the production data and applications as often as needed. Simply engage test mode for any volume at the remote site and the remote application servers are presented with the latest copy of the production volume. When the test is complete, simply disengage test mode and the state of the system reverts back, with no impact on production. But what if a failover and then a subsequent failback become necessary? This is much more difficult. DataCore Advanced Site Recovery automatically reverses the asynchronous replication direction after the production site is ready to re-synchronized with the latest updates that have transpired at the DR site. Once both locations are in synch, the production site can once again take over primary IT responsibilities. And, unlike other solutions, a full resynchronization of all the data is not necessary to bring the original site back online. This saves time, money, and a lot of frustration, not to mention prevents unnecessary downtime during the transition. The Advanced Site Recovery feature automatically reverses the asynchronous replication direction after a failover or failback operation to ensure that the alternate site receives all updates once services are restored. Talk with a storage expert to learn how DataCore can meet your organization’s disaster recovery needs with its Asynchronous Remote Replication technology.